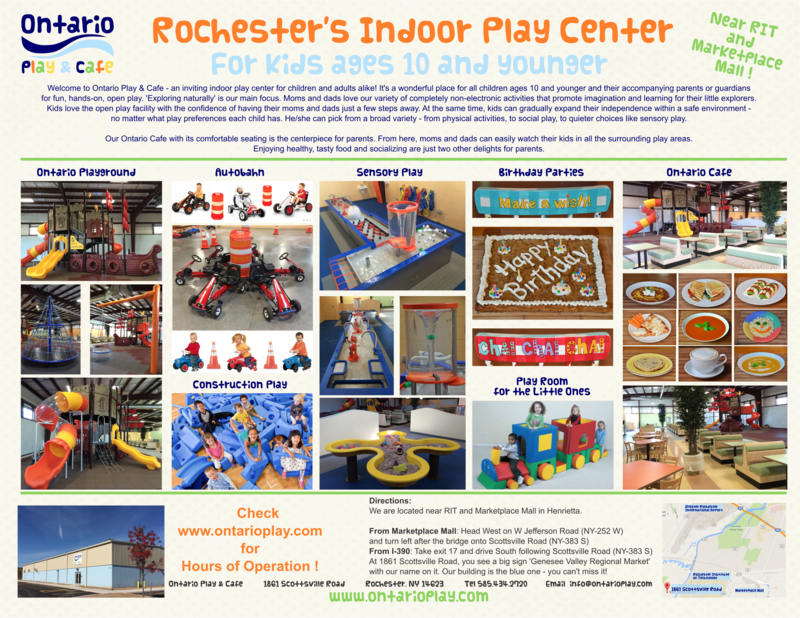 Ontario Play & Cafe - Play Center for Kids 10 and Younger - Welcome! Welcome ﻿﻿to﻿﻿ Ontario Play & Cafe ! 'Exploring naturally' is our main focus. Moms and dads love our variety of completely non-electronic activities that promote imagination and learning for their little explorers. Kids love the open play facility with the confidence of having their moms and dads just a few steps away. At the same time, kids can gradually expand their independence within a safe environment - no matter what play preferences each child has. He/she can pick from a broad variety - from physical activities, to social play, to quieter choices like sensory play. Our Ontario Cafe with its comfortable seating is the centerpiece for parents. From here, moms and dads can easily watch their kids in all the surrounding play areas. Enjoying healthy, tasty food and socializing are just two other delights for parents. Come and ﻿﻿﻿﻿join﻿﻿﻿﻿ us for fun quality play time ! Read the Democrat & Chronicle Article about us ! Check out those videos !